This was once to be found on the wall in her office, where ACD is rumoured to have penned a number of Holmes stories, but was moved to the main Bart’s Museum, so it could be seen by the general public. 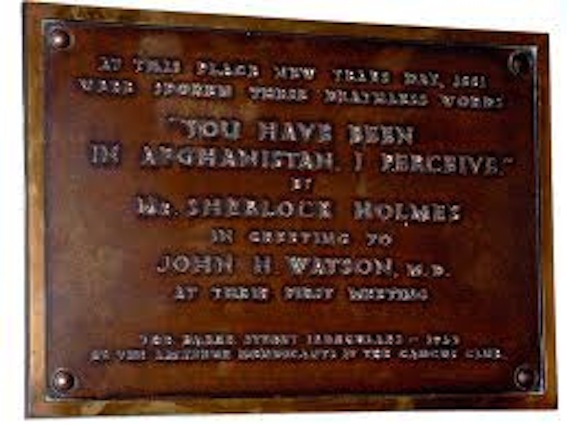 The phrase ‘You have been in Afghanistan, I perceive’ happens to be the official greeting of the new John H Watson Society (www.johnhwatsonsociety.com) which was founded earlier this year. More on the museum follows later. This entry was posted in Books and tagged Barts, Conan Doyle, Sherlock, Watson on September 3, 2013 by Robert Ryan.